Mirra Whale’s subject is the Honourable Don Harwin, the New South Wales Minister for Resources, the Minister for Energy and Utilities, and the Minister for the Arts. ‘There are paradoxes among the movers and shakers of the art world and in politics; Don Harwin is surely one of them,’ says the Sydney-based artist. ‘When I first considered painting his portrait I was impressed by his passion, curiosity and dedication to the arts. As for party politics, we probably pass like ships in the night. As a National Art School graduate, I am aware of the ongoing battle to protect the future of the school. Don’s support for the school speaks reams. 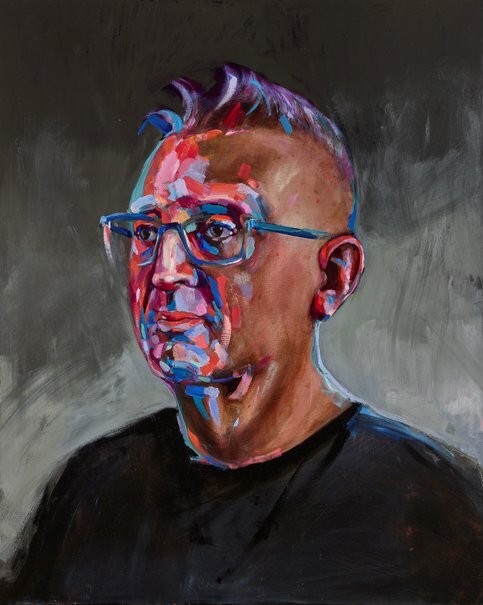 He has thrown a light onto art in New South Wales by facilitating the visions of our museums and public institutions with new funding and attention,’ says Whale, an Archibald finalist on three previous occasions.